At a time when computers have become indispensable and people have begun relying on the Internet to perform more than 90 percent of their tasks, it’s no surprise that libraries too have found their place in the digital world. This trend of virtual libraries has already proven to be popular among the developed and developing countries and concerned parties in the under developed regions too are also working hard to bring its conveniences to its people. Sajha Shikshya E-Paati, for instance, with their project E-Pustakalaya has already developed a collection of more than 7000 educational books and 3500 audio books based on various subjects from agriculture, health to literature. Further, their online library isn’t only accessible to city dwellers, they have developed a system that allows people from the rural areas to use their digital content as well. 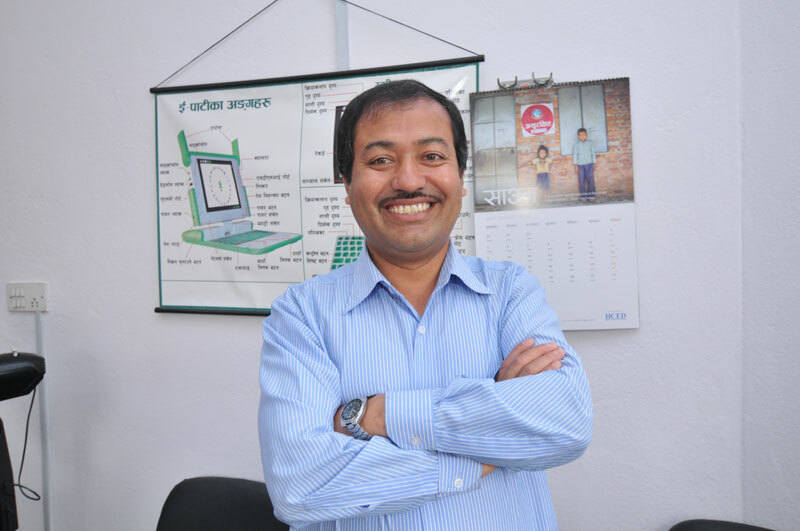 The Week talked to Tika Raj Karki, senior manager of Sajha Shikshya E-Paati to hear about their experience of running an e-library in our country. What prompted your organization to start an online library? We saw that there were various projects that were helping bring computers and laptops to schools but there weren’t many that supplied digital content. Owning computers alone can’t help with a student’s education so since we are a NGO that aims to help the education sector via technology, the initial idea was to open an e-library specifically with educational materials that could be useful for students. But later, the idea of an online library got a lot of interests from teachers, parents and the communities alike. They suggested that it would be very useful if there were books that would cater to them as well. We learnt that they too were keen to gather information on subjects like agriculture, animal husbandry, business and so on. So the E-Pustakalaya collection expanded to cover all these topics plus literature. How is it that your online library is more popular in rural areas than urban cities? Those in the cities have plenty of resources as it is. If they wish to get hold of a certain book, they can go to stores, download it from various sites or search for it on the Internet, but these options aren’t available to those living in the villages. It’s the main reason we also wanted to make sure this facility would be useful around Nepal. So while those with Internet can log on to www.pustakalaya.org, those without the Internet can also get these digital content offline. As long as you have a computer, we can help you download our collection in a server and set up a network. In these cases, we help update the server every six months. People in the villages often want to learn things but they don’t always have the means. In such cases, online libraries, like E-Pustakalaya that provides free information, is bound to be popular. What are the challenges of managing the logistics of such a program? E-Pustakalaya has its own team and a committee. The committee decides on the kind of books we add to our online collection. It also stays in touch with various writers and publishers as well as the concerned government bodies in the education sector so that together we can take this project to various schools and communities. The team helps with managing the online library. We download the pdf version of books as well as scan them so converting the material into digital form isn’t a problem. A lot of work goes into helping set up the server facilities for our member schools and communities and getting them acquainted with the technology as well. There wouldn’t be a point of opening an e-library if they don’t know how to access or use it. So we also provide a basic day’s training for those who need it. How do you think we can help this trend of e-libraries catch on in our country? I believe it all comes down to improving the infrastructures and generating more awareness. We all know about the importance of libraries for a community, especially when it comes to our children. Having them online makes the facility all the more accessible. As I mentioned before, all we need is a computer. Even among the 30,000 community schools in our country, 11,000 of them are said to have computers. But most don’t have good libraries because setting up one means they will require a separate room, and furniture. There is also the hassle of having to maintain the collection and preserve the books. However, with e-libraries we don’t have to worry about any of these factors. A single book can be used and enjoyed by several people. There is no fear of it being lost or torn and it is accessible at the click of a button. What’s more, we add to the collection on our website every day. The library only keeps expanding and becoming a richer source of information. We have many schools, some even from villages, reaching out to us because they want to make the most of the computer facilities that they have. The advantages of online libraries are obvious to them. If more schools and communities around the country were aware of them too, I believe online libraries would become more popular. This article has been retrieved from Republica .